Using the upper drop-down to the right of the current time display in the transport area of the main display, select Bars & Beats. This sets the timing units of the horizontal scale above an audio track. Select View > Settings from the menus at the top of the screen. This will display the Settings window. 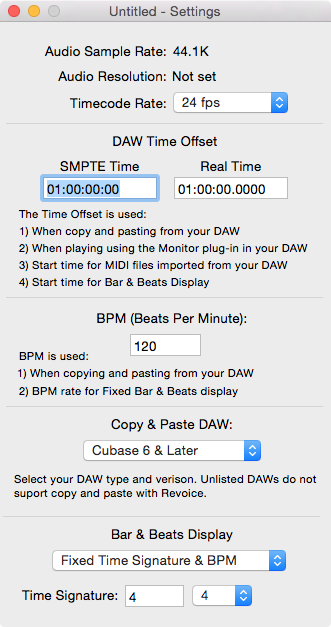 Enter the time at which you want the bars and beats count to begin, either in the SMPTE or Real Time box under DAW Time Offset, and press Return or Tab. This should normally match the start time of the related audio. Enter the number of Beats Per Minute in the BPM box. Select Fixed Time Signature & BPM in the Bars and Beats Display drop-down at the bottom, and choose a Time Signature to match your music. Close the Settings window, and you should now see a fine grid on the audio track, with bar/beat numbers along the top edge, as shown below. The bar lines are shown stronger than the beats.